South West Logistics Attends the 2017 Southern California Logistics & Supply Chain Summit. So, South West Logistics decided to once again take another look at this years Southern California Logistics and Supply Chain Summit. Juan Perez from Amazon Fulfillment – Juan touched on many of the highlights from Last years conference, such as employee enhancements and benefits, but then focused on Automation and how large Amazon as grown in the past 5 years, especially in the Inland Empire. Gary L Toebben – CEO LA CHAMBER OF COMMECE – Highlight was the continually, almost daily, changes made by bureaucrats on the logistics industry, by people who really do not know what the transportation is all about. Dr. RAT WOLF – TRANSPORTATION AUTHORITY OF SAN BERNARDINO. Dr. Wolf took us through the new infrastructures, freeways, toll roads, and Metrolink upgrades. An interesting note. San Bernadino County is larger than 8 of our nations states. Most of the population, however is concentrated in the South West corner of the county. The massive infrastructure upgrades is funded by Measure I, which was just extended another 30 years. With out the Measure I’s initial 20 years, we would not have the 71, the extended 210 Freeway, and the Metrolink would have not happened. Goal is to get more people off of the roads, free up traffic and allow Truckers more room and less congestion. BJ Patterson shared the same message basically from the 2016 event.. He shared his displeasure by stating “California is not the best state for doing business”. Many on the panel felt as though the California bureaucracy was dead set against helping the Logistics industry in any way. He brought up an Executive order from Governor Jerry Brown. The mandate stated that by 2030, 100,000 Commercial trucks are to be emissions free, or Zero Emission vehicles. 25% of current vehicles are to have an increase of 25% fuel efficiency by 2030 and.. We must increase California’s Competitiveness as well. Its very tall order that the logistics industry must adhere to by Executive order. BJ did however end his speech on how truly excellent the Logistics industry is. This is one of the very few industries left where a blue collar person can support their family into middle class standards. While many on the Panel agreed that we would all like to have clean air to breath, the restrictions and time lines are oppressive and unrealistic. This is and will be a pretty hot topic. Dr. Husing pulled no punches this go around. A fantastics Analyst and a regular contributor on KVCR. Dr. Husing simply stated that California’s Democratic Leadership is squeezing out the middle class, and trying to keep the poor, Poor! The Transportation industry one of the last great places for the Blue collar person to make a decent living and live within the middle class. BLOCKCHAIN – Technology. This is a whole new way of tracking all the stages of a particular load, it follows every person entrusted to handle said load, tracks payments and more. https://hbr.org/2017/03/global-supply-chains-are-about-to-get-better-thanks-to-blockchain For more in depth information. Moving medical equipment takes expertise and the utmost care from your moving company. At South West Logistics, Our moving crews are specifically trained for the proper packing, loading, unloading and installation of delicate medical equipment. Presentation is an important aspect of our delivery process, our crews are clean and presentable, our truck fleets are clean, well maintained and offer air ride suspension, so you can be assured that your sensitive equipment will arrive in excellent condition. 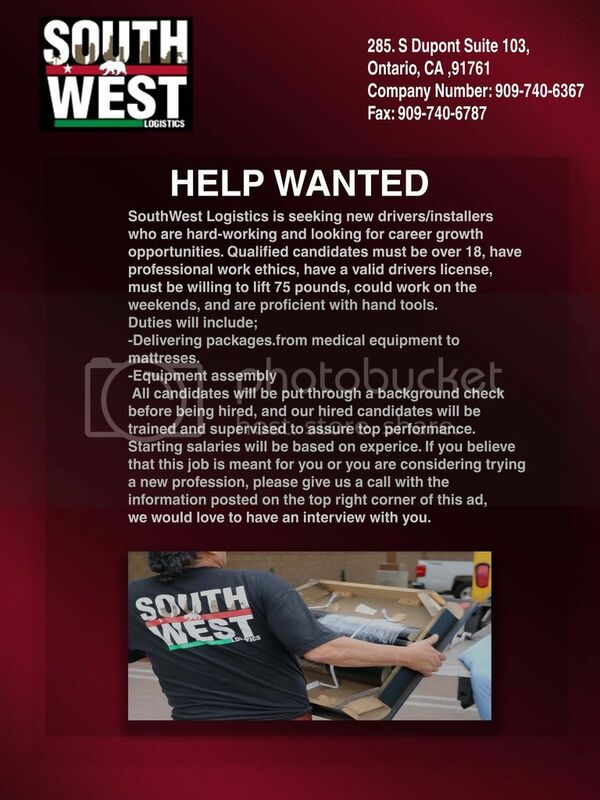 With more than 20 years of combined talent and expertise, South West Logistics knows the medical moving industry. Our dedication to White Glove moving services such as medical equipment installations and household/office furniture are paramount to our success in this industry. We take tremendous pride knowing that our customers give us an Excellent Ratings on nearly all of all of our deliveries. Locations: Ontario, CA, San Diego, CA. Fresno, CA. Bakersfield, CA. Hayward, CA. San Leandro, CA. Portland, OR. Seatac, WA. Spokane, WA. Yakima, WA. Denver, CO. SLC, UT. Reno, NV. Las Vegas, NV. Phoenix, AZ, Albuquerque, NM. Lubbock, TX. Dallas, TX. San Antonio TX, Austin, TX. Houston, TX Oklahoma City, OK. Minneapolis, MN. Thanks to our local NPR radio station, KVCR, we were informed and later attended the 2016 Southern California Logistics & Supply Chain Summit. South West Logistics is about educating, not only ourselves on new Logistics trends, but also brining new hot topics to you as well. This was our first visit to the Summit and we were really unsure what to expect. Juan Garcia from Amazon Fulfillment – Juan spoke on Amazons incredible employee programs. They introduced a program that helps employees leave the company. The program is designed to help employees, who are looking for growth, education to actually move on. They even have an bonus incentive program. Amazon will pay you up to $5,000.00 to leave the company. 1.4% of employees have actually taken pay to leave program. The point of this program, is Amazons encouragement for personal growth. Amazon also began to bring school to the office. Amazon offers classrooms and courses on the job site. Employees are encouraged to learn and are presented in class rooms with glass walls, for other employees to see, Yes, this is happening. Dr Nole Hacebaga, Chris Shimala, Lena Kent of BNSF, and BJ Patterson all spoke on matters concerning the Long Beach Port. Coming from perhaps the worst year in port congestion (2015), Dr. Noel spoke on how different Logistics companies came together and started sharing Trailer Chassis. The Chassis were shared by everyone to help get the freight out of the ports. It has been a big success. Cargo ships have more than doubled in size in just the past 5 years! This has made dock logistics even more congested, but lowered the cost of shipping a container from China from $2,100 just a few years ago, down to $700 or so. This resulted in many shipping companies to look at forming a collation and control the shipping prices across the seas. An OPEC for cargo if you will. Lena Kent from BNSF. To say that this board was frustrated with California policy towards the logistic industry, was an understatement. Lena let if fly with her clearly unhappy tone. “Its hard to get permits in California We spent 100 Million dollars over 14 years for a net loss”. BNSF spent 14 years and 100 million dollars building and proposing a Port Infrastructure plan, that according to her, would have helped Long Beach with the massive flow of products into the ports, and help keep Long Beach the go to port for Logistics on the West Coast. A judge denied their case and it was over. With Crude oil down and Coal down as well, BNSF is struggling and this California setback didn’t help much either. BJ Patterson shared his displeasure by stating “California is not the best state for doing business”. Many on the panel felt as though the California bureaucracy was dead set against helping the Logistics industry in any way. He brought up an Executive order from Governor Jerry Brown. The mandate stated that by 2030, 100,000 Commercial trucks are to be emissions free, or Zero Emission vehicles. 25% of current vehicles are to have an increase of 25% fuel efficiency by 2030 and.. We must increase California’s Competitiveness as well. Its very tall order that the logistics industry must adhere to by Executive order. BJ did however end his speech on how truly excellent the Logistics industry is. This is one of the very few industries left where a blue collar person can support their family into middle class standards. Southern California gas is rolling out its Natural Gas Vehicle Truck load program. This program focuses on the introduction of Natural Gas vehicles to Diesel fleets. There is a lot more information on this program. Visit socalgas.com or contact us at info@southwestlogisticsinc.com. We will be happy to send you over more information. Summary: In short, the Logistics industry is strong. There is a tremendous struggle with California’s ever tightening restrictions on business, making it very hard to grow, but grow we have. Companies like Amazon, E-Bay have reversed the logistics model. Giant warehouses and many different types of vehicles all bringing your products to you. All requiring some sort of logistics solution. Assessment? The logistics future is very bright. At South West, we order new and exciting products. From hats to clocks, we constantly look for unique items to not only promote our company, but to also offer quality products for our customers. We are sending shirts out to anyone who wants a great quality T-Shirt. Our shirts come in L and XL. Colors come in Pink, Navy Blue and Red in the Grey on Grey Logo and the Classic Black shirt with the Standard Logo color scheme. We also have company Tags and Lanyards for our Vendors who might not have a set as of yet. If you are interested in purchasing any of these items, contact us. White Glove is more than our profession, it’s our passion. Medical equipment such as beds, wall installations, and other equipment deserves a service that will respect the products. It is our responsibility that our clients see first-hand our talents in White Glove Services. There is only one level of White Glove Service we offer. Our best. Delivery: We deliver all products in their original protected packaging to ensure that your products will arrive in good care and undamaged. Installation: During the installation process, we take care to unpack and assemble all delivered items. From Beds, to Wall mounted devices, our team assembles every item with great care. Clean Up: Once our team has completed the install, every carton, cardboard box, and debris is picked up and removed off of the premises. Floors are swept, counters are wiped down. Complete: We leave the premises spotless and present you with a “ready to go” appearance. Here is a partially installed room. Now the wall mounts are going to be installed. This is a room that has been completed and is ready to go. South West Companies have been serving Business-to-Business in the industry throughout the United States for the past 30 years. Clients can depend on us to store, transport, and deliver their equipment with skill and care. We will closely inspect all items for quality control, cross-reference shipping documents, and technology systems to ensure accuracy. South West Companies have more than 30 years of experience in handling and transporting sensitive and invaluable inventory, so you can trust us for any specialized shipping requirement. Whether your need is a simple adjustment to your existing layout, or a complete new installation. Perhaps you are planning to downsize, or may need vacate your present office space? Whatever situation you may be in, South West is here to help. South West offers years of experience, working with all major brands and models of Systems Furniture; we will disassemble, palatalize, inventory, remove, and ship or store your furnishing. Dedicated Team from Start to Completion. South West Movers put the green back into transportation. We are “future capable” by providing a higher level of environmentally sustainable methods. Trucks less than five years old. Moving pads made of 100% recycled cotton.